Some recipes call for mussels to be removed from their shells especially when they are just one element of a larger dish – such as Tom Aiken’s Bouillabaisse or Simon Hulstone’s Mussels mouclade with spinach mousse. 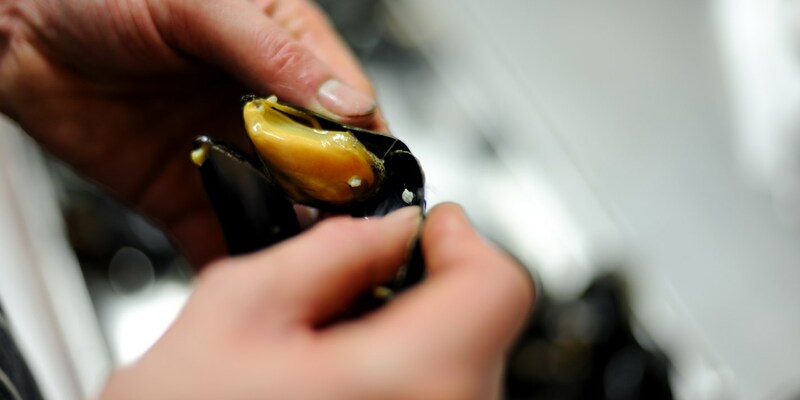 Extracting the mussels for use in this way is very simple when you know how. Reserve the mussel cooking liquid to use as a base for a rich sauce. When preparing the mussels for the finished dish, remember that they are already cooked so only require very gentle reheating for a very short time. Too much cooking at this stage will make the delicate mussels rubbery. Many recipes call for shelled mussels for their soft texture and sweet flavour of the sea. Try Shaun Rankin’s Linguine with mussels, Kevin Mangeolles Pan-fried sea bass with Brancaster mussels, gnocchi and fennel or Matthew Tomkinson’s Hake with courgettes, Provençal mussel sauce and crispy breadcrumbs.